Not to be confused with Synge Street CBS. Sing Street is a 2016 musical coming-of-age comedy-drama film co-written, co-produced and directed by John Carney. Starring Ferdia Walsh-Peelo, Lucy Boynton, Maria Doyle Kennedy, Aiden Gillen, Jack Reynor, and Kelly Thornton, the story revolves around a boy starting a band to impress a girl in 1980s Ireland. It is an international co-production between producers from Ireland, the United States, and United Kingdom. The film had its world premiere at the Sundance Film Festival on 24 January 2016. It was released in Ireland on 17 March 2016, in the United States on 15 April and in the United Kingdom on 20 May. The film received positive reviews from critics, grossed $13 million worldwide and was nominated for Best Motion Picture – Musical or Comedy at the 74th Golden Globe Awards. In south inner-city Dublin in 1985, Robert Lawlor is struggling with his architecture practice and his marriage, and drinks and smokes to excess. At a family meeting, he announces that in order to save money he is taking his youngest son Conor out of his expensive fee-paying school and moving him to a Christian Brothers school, Synge Street CBS, which Robert asserts is of equally high repute. Conor's elder brother Brendan ribs him about the change as well as about the state of the family unit. Conor appears in school on the first day in his new uniform, but without the regulation black shoes. The school principal Br. Baxter, takes him to task for this despite Conor’s pleas of being unable to afford new black shoes, eventually forcing him to complete the day shoeless. The shoe problem is resolved by painting the shoes black using paint from the art room. An encounter with the school bully, Barry introduces Conor to Darren, an ally and budding entrepreneur. When Conor tells the beautiful aspiring model, Raphina, in order to impress her, that he needs a model for a music video his band is making, Darren agrees to manage the band and introduces him to multi-instrumentalist Eamon. The band practices in Eamon's living room, playing a bunch of 1980s covers. Conor, however, has a sibling-induced epiphany when Brendan encourages him to drop the covers and develop the band's own style. He begins writing original songs with Eamon, describing themselves as "futurists." The band film their first music video for their song "The Riddle of the Model", wearing a motley assortment of comical costumes, with Raphina acting as ingenue and makeup artist. Conor goes into school the next day wearing make up, he gets called into Baxter's office and told to remove the makeup. Conor refuses and as he walks away Baxter grabs him forcing him into the bathroom and forcibly removing the make up by pushing his face into a sink. Raphina gives Conor his nickname "Cosmo", which she says is more in keeping with his new band's image and the band continues to write and record new songs. After spending the day filming a music video for a new song, Conor and Raphina kiss and exchange confidences. Conor also manages to stand up to Barry by pointing out the insignificance of his life as well as his own, which greatly upsets Barry. At home Robert and Penny's marriage is falling apart, while Raphina and Conor's relationship blossoms. Conor takes Raphina out to Dalkey Island in his granddad's motor cruiser. Here they view the car ferry leaving Dún Laoghaire for Britain and discuss Raphina's dream of leaving Ireland for London. Conor, Raphina, and the band then prepare to film a Back to the Future-inspired music video for their new song, "Drive It Like You Stole It", but Conor is disheartened when Raphina fails to show up. Later, she reveals that she was set to leave for London with her boyfriend that day, but he abandoned her. Deeply hurt by her lack of disclosure and becoming even more offended by her nonchalance, Conor breaks up with Raphina. Because of the break-up, along with his family's problems, Conor finds difficulty in writing or playing music, but Brendan urges Conor to carry on so that at least he can escape his small-town doldrums and make a better future for himself. An opportunity arises for the band to play live at an end of year party at school. Conor manages to strike a friendship with Barry, offering him the chance to be the band's roadie and escape the physically and emotionally abusive relationship he has with his alcoholic father, which he accepts. Conor prepares a new song, "Brown Shoes", mocking Baxter, which the band perform as an encore while distributing homemade masks of Baxter’s face. Raphina arrives before the band finishes their song and reconciles with Conor, and both of them leave the party and the school in uproar. After secretly saying his goodbyes to his family later that night, Conor and Raphina persuade Brendan to drive them to Dalkey so they can escape in the motor cruiser and head to London. Brendan agrees and drives them to the harbour, where Brendan and Conor exchange an emotional embrace. Conor and Raphina sail out to sea, following the ferry across the rough Irish Sea to a new life in London. Brendan watches them disappear into the distance and cheers, overjoyed that his younger brother has left to go on to greater things. Cast of Sing Street at the 2016 Dublin International Film Festival. Left to right: Percy Chamburuka, Mark McKenna, Kelly Thornton, Ben Carolan, Karl Rice, Conor Hamilton. In February 2014, it was announced that John Carney would be directing the film, from a screenplay he wrote about a boy starting a band in order to impress a girl. Carney would produce through his Distressed Films banner, along with Anthony Bregman through his Likely Story Banner, Kevin Frakes for PalmStar Media, and Raj Brinder Singh for Merced Media Partners, with Paul Trijbits and Christian Grass for FilmWave. The film is a semi-autobiographical depiction of Carney's upbringing in Dublin. In a July 2014 interview, Carney announced he would be casting unknown actors in the film. The unknown actors turned out to be Ferdia Walsh-Peelo, Ben Carolan, Mark McKenna, Percy Chamburuka, Conor Hamilton, Karl Rice, and Ian Kenny. 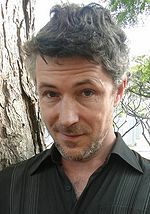 In September 2014, it was announced that Aidan Gillen, Maria Doyle Kennedy, and Jack Reynor had joined the cast of the film, portraying the role of Conor's father, mother and brother respectively. Principal photography on the film began in September 2014 in Dublin, Ireland, and concluded on 25 October 2014. Its namesake school, Synge Street CBS, was among the shooting locations for the film. Much of the original music by the band "Sing Street" was composed by Danny Wilson frontman Gary Clark, with Carney, Ken and Carl Papenfus of the band Relish, Graham Henderson and Zamo Riffman also receiving writing credits. Adam Levine co-wrote (with Carney and Glen Hansard) and sings on the track "Go Now". The film also features music of the period from The Cure, A-ha, Duran Duran, The Clash, Hall & Oates, Spandau Ballet, and The Jam. In February 2014, it was announced that FilmNation Entertainment had been selected to sell international rights to the film. In May 2014, it was announced The Weinstein Company had acquired U.S distribution rights to the film, for $3 million. The film had its world premiere at the Sundance Film Festival on 24 January 2016. The film screened at the Dublin Film Festival on 18 February 2016, and at South by Southwest on 11 March 2016. The film was released in Ireland on 17 March, and in the United Kingdom on 20 May 2016. It was released in the United States on 15 April 2016. Sing Street grossed $3.2 million in the United States and Canada, and $10.4 million in other countries for a worldwide total of $13.6 million. In the United States, the film made $63,573 from five theaters in its opening weekend, an average of $13,796 per venue. On review aggregator website Rotten Tomatoes, the film has a critic approval rating of 95% based on 199 reviews and an audience approval rating of 92% based on 16,672. The website's critical consensus reads, "Sing Street is a feel-good musical with huge heart and irresistible optimism, and its charming cast and hummable tunes help to elevate its familiar plotting." On Metacritic, the film has a weighted average score of 79 out of 100 based on 38 critics, indicating "generally favorable reviews". Audiences polled by PostTrak gave the film a 96% overall positive score and an 85% "definite recommend". Guy Lodge of Variety.com gave the film a positive review, writing "Perched on a tricky precipice between chippy kitchen-sink realism and lush wish-fulfilment fantasy, this mini-Commitments gets away with even its cutesiest indulgences thanks to a wholly lovable ensemble of young Irish talent and the tightest pop tunes—riffing on Duran Duran and the Cure with equal abandon and affection—any gaggle of Catholic schoolboys could hope to write themselves. Given the right marketing and word of mouth, this Weinstein Co. release could Sing a song of far more than sixpence." In The Observer, Mark Kermode gave the film four out of five stars, writing: "When it comes to capturing the strange, romantic magic of making music, few modern film-makers are more on the money than John Carney." He added, "The bittersweet, 'happy sad' drama that follows has drawn inevitable, if misguided, comparisons with The Commitments, yet tonally this is closer to the teen spirit of Todd Graff's 2009 film Bandslam [...] or even Richard Linklater’s sublime School of Rock. As Carney has proved previously, he knows how to straddle the line between the sound in the room and the sound in your head – a sequence that segues from bedroom composition to living room rehearsal (with tea and biscuits) to full studio production perfectly negotiates the space between kitchen-sink realism and musical fantasy in which this lovely, lyrical movie casts its spell". Kermode concluded by saying, "Happy sad indeed. I laughed, I cried, I bought the soundtrack album." The film was released on DVD and Blu-ray on 8 August 2016. ^ "Film Distributor's Association - Past, present and future releases". Retrieved 19 February 2016. ^ "SING STREET (12A)". British Board of Film Classification. 15 March 2016. Retrieved 15 March 2016. ^ a b c "Sing Street (2016)". British Film Institute. Retrieved 17 March 2017. ^ "Sing Street DVD release date + Netflix". OnDVDReleases. Retrieved 31 January 2018. ^ a b "Sing Street (2016)". Box Office Mojo. Retrieved 27 December 2016. ^ a b "Sing Street". Sundance.org. Retrieved 19 January 2016. ^ a b "Sing Street". FilmDates.co.uk. ^ a b D'Alessandro, Anthony (23 February 2016). "Weinstein Co. Dates 'Sing Street' & Roberto Duran Boxing Title 'Hands of Stone'". Deadline Hollywood. Retrieved 23 February 2016. ^ "Sing Street". RTÉ.ie. 18 February 2016. ^ McNary, Dave (6 February 2014). "Berlin: Bono, The Edge on Board for John Carney's 'Sing Street'". Variety. Retrieved 19 January 2016. ^ "'Once' director reteaming with U2 on new movie". HitFix. Retrieved 19 January 2016. ^ Molumby, Deirdre (1 July 2014). "John Carney Will Cast Unknown Actors in 'Sing Street'". Iftn.ie. Retrieved 19 January 2016. ^ Douglas, Edward (1 July 2014). "Interview: Once Director John Carney Begins Again". Comingsoon.net. Retrieved 19 January 2016. ^ "Sing Street Production Notes" (PDF). TWCPublicity.com. Retrieved 19 January 2016. ^ Butler, Laura (17 September 2014). "Love/Hate's Aiden Gillen will join Jack Reynor for John Carney's new film Sing Street". Independent.ie. Retrieved 19 January 2016. ^ Brosnan, Sean (17 September 2014). "Aiden Gillen Joins Maria Doyle Kennedy and Jack Reynor in John Carney's Sing Street'". Iftn.ie. Retrieved 19 January 2016. ^ SSNInsider Staff (27 October 2014). "On the Set for 10/27/14: Russell Crowe & Ryan Gosling Start Shooting 'The Nice Guys', Kate Beckinsale Wraps 'The Disappointments Room'". SsnInsider.com. Archived from the original on 26 January 2016. Retrieved 19 January 2016. ^ "Look! Photos from Sing Street set in Dublin". RTÉ TEN. 23 October 2014. Retrieved 19 January 2016. ^ "'Sing Street' Soundtrack Details - Film Music Reporter". ^ "'Sing Street': Sundance Review". ^ "How the 80s Pop Sound of Sing Street Continues John Carney's Musical Voyage - HeadStuff". 13 April 2016. ^ "Sing Street". AllMusic.com. Retrieved 31 May 2016. ^ Nolfi, Joey (8 April 2016). "Hear new Adam Levine song 'Go Now' from Sing Street". Entertainment Weekly. Retrieved 12 May 2016. ^ "SING STREET - Official US Trailer - The Weinstein Company". The Weinstein Company. Retrieved 15 January 2016. ^ "'Sing Street' Soundtrack Details". filmmusicreporter.com. 17 March 2016. Retrieved 27 March 2016. ^ Fleming Jr, Mike (6 February 2014). "Berlin: John Carney's 'Sing Street' With U2's Bono And The Edge To Be Sold Offshore By FilmNation". Deadline Hollywood. Retrieved 19 January 2016. ^ Seetoodeh, Ramin (17 May 2014). "CANNES: Weinstein Co. Picks Up John Carney's 'Sing Street'". Variety. Retrieved 19 January 2016. ^ Chapman, Adam (17 December 2015). "'Sing Street' to open Dublin film festival". ScreenDaily.com. Retrieved 19 January 2016. ^ "SXSW schedule Sing Street". South by Southwest. Retrieved 6 May 2016. ^ "Rave reviews for Carney's Sing Street at Sundance". RTÉ.ie. 25 January 2016. ^ a b Brooks Jr, Brian (17 April 2016). "A24's 'Green Room' Thrills; Tribeca Opener 'First Monday In May' Bows Slow: Specialty Box Office". Deadline Hollywood. Retrieved 1 February 2018. ^ "Sing Street (2016)". Rotten Tomatoes. Fandango Media. Retrieved 23 April 2018. ^ "Sing Street Reviews". Metacritic. CBS Interactive. Retrieved 1 February 2018. ^ Lodge, Guy (25 January 2016). "Sundance Film Review: 'Sing Street'". Variety. Retrieved 31 January 2016. ^ Kermode, Mark (22 May 2016). "Sing Street review – pop goes the playground". The Observer. London. Retrieved 18 December 2016. ^ "2016 Austin Film Critics Awards Nominees". AustinFilmCritics.org. Retrieved 27 December 2016. ^ "La La Land Leads with 12 Nominations for the 22nd Annual Critics' Choice Awards". Critics' Choice. 1 December 2016. Retrieved 1 December 2016. ^ Kilday, Gregg (12 January 2017). "'Moonlight' Leads Gay and Lesbian Entertainment Critics' Dorian Award Nominations". The Hollywood Reporter. Retrieved 16 January 2017. ^ Pape, Danny (7 February 2017). "Star Wars: Rogue One Leads Empire Awards 2017 Nominations". Flickreel.com. Retrieved 3 March 2017. ^ "Golden Globes 2017: The Complete List of Nominations". The Hollywood Reporter. 12 December 2016. Retrieved 12 December 2016. ^ "Houston Film Critics Nominations for 2016 Films". MovieAwardsPlus.com. 13 December 2016. Retrieved 15 December 2016. ^ "Houston Film Critics Society Nominations – 'The Nice Guys' and Rebecca Hall Get a Deserved Boost". AwardsCircuit.com. 13 December 2016. Retrieved 15 December 2016. ^ "IFTA 2016 Winners". Irish Film & Television Academy. Retrieved 1 July 2016. ^ "National Board of Review Announces 2016 Award Winners". National Board of Review. 29 November 2016. Retrieved 29 November 2016. ^ "Sing Street [DVD] ". Amazon. Retrieved 1 August 2016.